Idromed 5 PC is one of the most well known models of iontophoresis device used by hyperhidrosis patients. 1 x shock-proof suitcase; the 2 half’s of the suitcase also double as treatment tubs. Have you tried Idromed 5 PC, or know someone who did? Let everyone know how did it go – please write a quick review on Idromed 5 PC by clicking the button below. Hi everyone, I have Idromed 5 PC and I can honestly say that this machine is amazing and it has changed my life. It is easy to use and best of all it is painless. It has its price but so do Botox treatments , at 2500$ for treating just the hands and the fact that the botox treatments have to be repeated , the cost of a machine that you only buy once because it lasts a lifetime is money well spent. The only drawback of this machine is the time consumption. I must use it every day for 2 hours. One hour for my hands & the other hour for my feet. Also, when the weather is very hot or when I’m stressed, it starts sweating again but not as bad as before I use the machine. A nice device (rhyme not intended), Idromed 5 PC proved to be useful. I treated my hands and feet, which sweat too much since forever, but now that I started doing iontophoresis, they sweat a lot less. The best thing about Idromed 5 PC is that it uses pulsed current. I once before used a direct current device, and in comparison, pulsed current is much better - gentler, and I daresay more efficient as well. I take treatments every day for weeks now, and my hands and feet are not sore at all, and I sweat less, so I'm clearly using a strong enough current. Another thing I strongly like is that Idromed is very easy to travel with. It can be neatly packed in minutes, and is not heavy. A good and very well made iontophoresis device that gives satisfactory results. I am allergic to nickel and cobalt, and was a little vary toward iontophoresis. It turned out that Idromed's electrodes really are 100% nickel-free, so after realizing that my skin is not peeling off – no rash or any other allergy symptom – I was happy to continue using this device. I also really loved the foot switch – it made treating palmar hyperhidrosis super easy. Pulsed current allowed for careful, even gentle treatments, so I kept increasing the intensity and wave percentage as weeks went by. After six weeks, I finally found myself with nearly dry palms. This is wonderful. :o) Worth every cent, and recommended! What can I say? I'm still sweating. This didn't turn out to be my dream solution for hyperhidrosis... Okay, to be fair, I'm sweating less, but this is not what I expected when I bought the device. My settings are 3 mA for underarms at 10 min per treatment, and 12 mA for hands at 20 min per treatment. Maybe that's too weak, but I dislike stronger current or longer treatments. Armpit patches are pretty well made, and the whole machine looks like a solid piece of equipment, which is why I'm giving it a middle rating even though I'm still sweating. To be honest, my hands and underarms are not as sweaty as before, so this device helped me a little. I had it for 2 months and who knows; maybe it will get better with time. I'm ecstatic ever since I ordered this iontophoresis unit, because it worked better than I could imagine. It cured my sweaty feet and now I can buy loads of pretty shoes and live like a normal human being. Ha, imagine that! I love the unit's modern design and the fact you can clamp it together into a cool suitcase. I'm not embarrassed to take Idromed when going to the vacation with friends, and I don't even bother to hide my treatments. Everyone thinks it looks cool - a real high-tech therapy. And that's exactly what it feels like. The sessions feel good and the only side effect I experienced is dry skin on my feet. I use a special foot cream that soothes this and keeps my skin soft. A good investment and I hope that this unit will last me for many years to come. I really have no complaints - my palms are dry for a year and a half now. 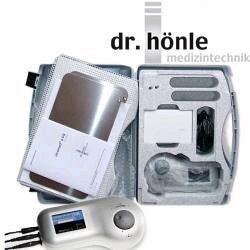 Before using Idromed 5 PC I consulted my dermatologist, who had experience with iontophoresis patients, and she gave me precise instructions oh how to use this device to my best advantage. The fact I was heavily informed helped me a lot, preparing me for tedious first weeks, when I had treatments almost every day. At first I had only partial success. Then I started using slightly larger amount of water to make sure my palms are completely underwater, and the results improved. Make sure you don't make the same mistake! I hope my Idromed will last for many years - that way I'd feel less guilty for spending so much on it. I have been using Idromed 5 PS for over more than a year - it has helped a great deal for my sweat problem! It does take some time and lot of dedication to make it work though... initially, I did not get any consistent results for almost a couple of weeks and just when I was about to discontinue the treatment I started seeing some minor improvements. The real improvement came only after 6 weeks of regular treatment and I have been able to maintain it from thereon. My sweat is probably about 5% of what it was before Idromed 5 PC. Now, i need to repeat treatment about once every week to keep the sweat out. It just takes some dedication and persistence to do it over and over again week after week! 🙁 I wish it was more permanent. However, its atleast non invasive and no serious side effect. I am very happy with my Idromed 5 PC, especially because it uses pulsed current, and to me these Iontophoresis treatments are much more pleasant than those I had in a physician's office using direct current. The tingling is barely noticeable and pleasant, and the results are even better than before. Maybe I should note that I'm getting great results with tap water and a bit of baking soda. My hands and feet feel wonderfully dry after the treatments, and I'm doing maintenance 2 times a week for my hands & once a week for my feet. “Frank” is writing about mediocre results, but imo he probably just didn’t use the device properly, or did something wrong somewhere. If he’s reading this, I’d recommend that he increases the mA and maybe even treatment times. Maybe that will help.